These cute hair clips are like nothing I've ever seen. You can sew your own designs for any day of the week. This is a great DIY craft to make with your girlfriends. ****Please read through this entire tutorial prior to starting your little Pretties. You can choose to add the flower or not. 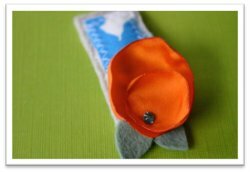 If you don’t want the flower, skip the steps in making, sewing, and attaching it to your Pretties. Felt- Cut out two leaf shapes for your flower. 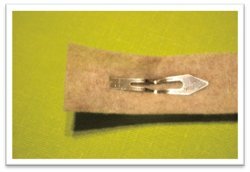 For each snap clip you will need two pieces of felt cut ½” wider and ½” longer than the width and length of the actual snap clip. For these Pretties, I used 1 7/8” rectangular snap clips to make the sewing a bit simpler. After cutting your two rectangular pieces of felt, take one of the pieces (bottom piece) and measure down ½ from the length side, and make a ¼” snip with your scissors. This will be the opening to place your snap slip through. Unsnap your clip and slip the thin pointy part of the clip through the snip you just made. 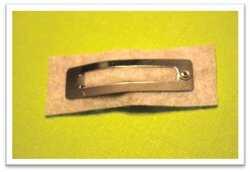 Center the clip and snap it closed so that it is spaced evenly on the length and width sides. Satin- Using your Quarter and Nickel as a template, trace one of each onto the satin scrap. Cut out the circle shapes, and using a lighter, quickly singe the edges of the circle shapes. Singeing these, by quickly running the flame over the outer edges of the fabric, causes the edges to shape upwards like a petal. Test a piece first so that you don’t burn the satin! 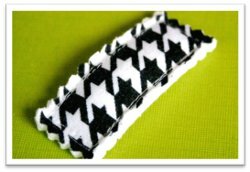 Fabric Scraps- Cut one fabric scrap piece ¼” wider and longer than the width and length of the actual snap clip. You only need one scrap piece per clip. 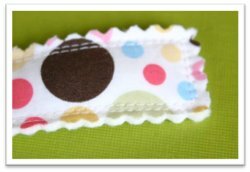 Sewing- Grab your fabric scrap piece that you cut and center it onto the felt top piece (the one without the slit). Use a 1/8” seam allowance and stitch the fabric onto the felt. Next, place the top piece on top of the bottom piece so that the thin portion of the clip is on the bottom. 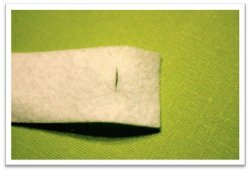 The long rectangle portion (picture above on right side) should be sandwiched in between the top and bottom pieces of felt. Stitch the two pieces of felt together using a ¼” seam allowance (do not sew the snap clip!). 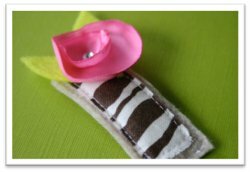 Take the two satin “petal” pieces and layer them with the smallest piece in the center of the largest, and then place the two leaves underneath the flower. Using small handstitches, stitch the flower and leaves where you prefer. Using craft glue, attach your crystals (allowing them to dry completely). If you’d like the edges to be decorative, you can use pinking shears to cut all four sides of your little pretties. I think I can do this! even with one arm in a cast!! I'm so excited. Hola Las chicas van adorar el clip para el cabello. Linda idea. Besitos. This is such a cute idea! I will definitely put this idea to use! How clever... Thank-You Linderella!